It’s not very often that you meet someone who can talk to you about a coffee bean for hours and just amaze you with their knowledge on stuff you didn’t even know about coffee – but lucky me, because I met Audrey, the coffee roasting genius and one half of Red Cherry Coffee Roasters. Audrey and her husband, John have set up an amazing coffee roasting facility, albeit part of their garage in Cape Town environs, located up in the hills at a place called Noordhoek. I was lucky enough to be tracked down by them and more so to be invited over to check their operation out. Audrey is really “mad about coffee” and I often describe her as “someone who can talk to you about a coffee bean for hours” and I’m not joking. She may be relatively new to roasting (a few years already) but she’s travelled to London to meet with Square Mile Coffee Roasters (James Hoffman & Anette Moldvaer) to get tips, constantly studies everything there is to know about a bean before she roasts and doesn’t compromise on quality. In summary, they’ve got a coffee roaster in their garage alongside highly prized green arabica beans, ready for the “roasting”. Once roasted, after a lot of research by Audrey, where farms, altitude, varietal (i.e. type of bean) and many more variables have been checked, the coffee is usually “rested” for several days as it goes through a rapid de-gassing process. 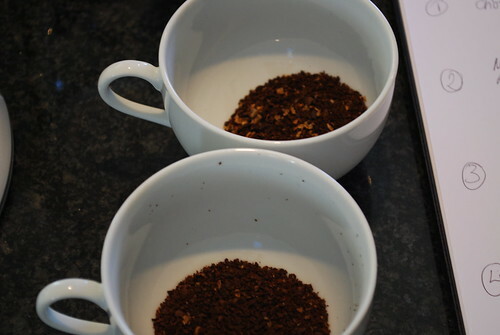 In this way through cupping, this will ensure that the correct profile for that specific origin will be determined. For the cupping, done in their well equipped kitchen, the coffees are weighed, ground and placed into specialist coffee tasting cups to ascertain flavour profile and characteristics, which helps to decide which coffees would go well in blends or just sold off as single estate origin coffees. In addition, John, a trained barista and chief taster, pulls different types of shots on their very advanced ExpoBar Espresso Machine (where you can adjust the temperature easily per shot) to try and test at different temperatures, which coffees have brighter notes and which ones have lower tones. For example, higher notes generally bring out chocolate, caramel and nutty tastes, which go well with milk based espresso drinks or just as pure espresso. 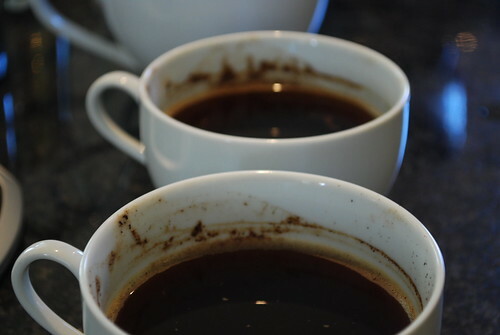 The sharp taste you get when you slurp coffee is usually the mark of high acidity in a coffee, typical of African coffees, usually roasted by Red Cherry to preserve the bright fruity tones. African coffees are usually quite complex, whilst Indonesian coffees tend to display more earthy tones – OK ! what’s that ? By earthy we mean spices that grow in the earth like vanilla, cardamon and cocoa. Central American coffees are lovely when roasted lighter as you get brighter notes like mandarin, peaces and apricots, but when roasted a bit darker, you get higher notes like chocolate, caramel and toffee. Kenyan coffees have dark fruit characteristics like blackberries and Tanzanian coffees can display citrus hints like lemon, dark fruits, dark chocolate and honey. Wow ! all this in a cup of coffee – better believe, BUT, only if it is properly roasted by an artisan roaster. 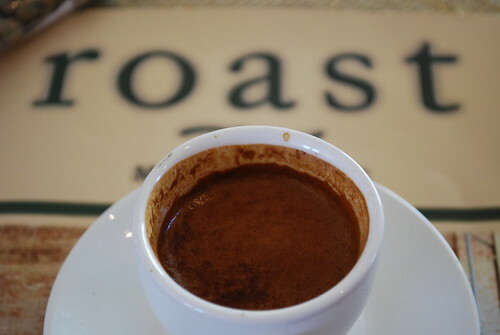 Light roasted coffees are usually best extracted at a temperature of around 92-94 C, where the emphasis would be on tasting the “brighter notes” of the coffee. However, these type of lighter roasted coffees can be intense and may be better enjoyed without milk. You see, I need a home machine like the ExpoBar – anyone feeling generous ? 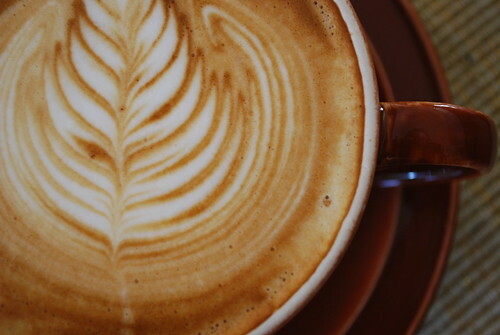 Medium roasted coffees are usually best extracted at a temperature of around 94-95 C, where the emphasis would be to get the chocolate and nutty tastes like almonds, hazelnut, coupled with toffee and honey like tastes – probably best for milk based espressos. Good coffee should still taste nice even when drank at lower temperatures, but more so when extracted using a French Press or Plunger. There were some other lessons, but I was overwhelmed by the information and was probably cutting them in conversation as I tongue couldn’t stop as I fired away with questions out of pure excitement and delight at this incredible coffee experience. I’ve already been to seen them thrice, making sure that I save myself for some exquisite coffee before I go. Even my wife, who doesn’t drink coffee (OK ! perhaps 8 times a year) has always asked for a cup whenever she goes. My favourite is a flat white, because Red Cherry are really into perfecting the ultimate milk-based espresso blend, which I think they are close to as the current rumoured number one cafe in South Africa, is supposed to be Double Shot of Plettenberg Bay and they buy coffee from Red Cherry. Furthermore and hot of the press, Audrey has been selected to be an international juror at the prestigious “cup of excellence” in El Salvador, where she will mingle with the World’s top roasters and tasters to determine the cup of excellence winners for 2010 – need I say more ? OK ! So, how do you get this coffee ? Well ! 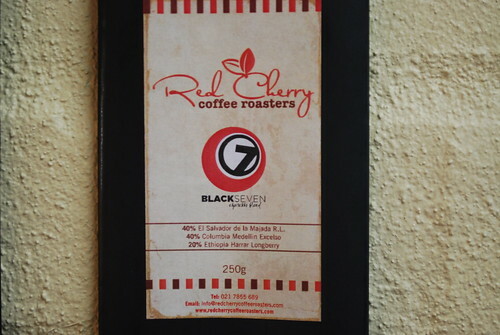 at the moment, you can contact them by visiting their website, www.redcherrycoffeeroasters.com, selecting a coffee or some coffees you would like to try and give them a call for a good old chat about coffee but watch your phone bill and place an order – they’ll ship within South Africa. They plan on launching a webshop very soon and are working on selling their coffee through some retail outlets, so watch this space for that memorable day. Just wanted to let you know that Red Cherry provided some inputs to the editing of this blog as it was easy for me to misunderstand some of the finer elements of the complicated and wonderful world of coffee. This entry was posted on Wednesday, April 28th, 2010 at 10:57 pm	and tagged with Beans, coffee, Coffee Roasters, Cup of Excellence 2010, red cherry coffee and posted in Bean Talk - Coffees, Coffee News, Coffee Roasters. You can follow any responses to this entry through the RSS 2.0 feed.